from x=0 to x=2. Note that throughout my method I worked in radians. Mid-point rule- this method was adopted because it is used to approximate the area underneath the graph by dividing it up into individual rectangles. Trapezium rule- this method was adopted because it is used to approximate the area underneath the graph, this is done so by dividing it up into individual trapeziums. 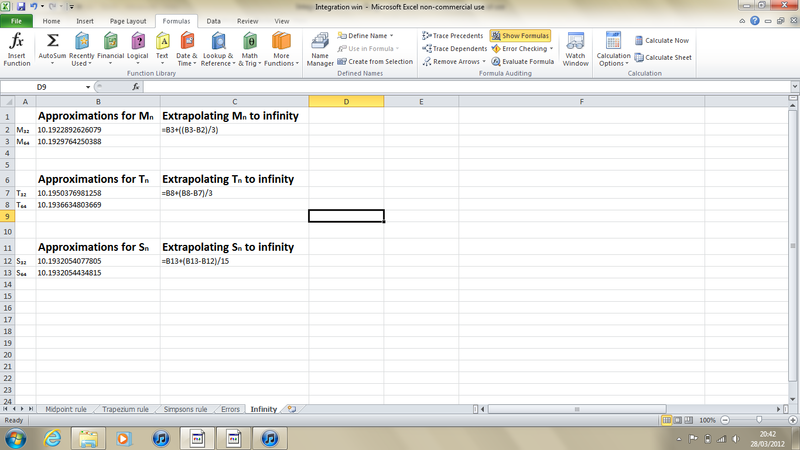 Extrapolating my answers to the Simpson’s rule to infinity will be the most accurate answer that I can give. As all three rules are actually only approximations there is always error involved, they are all gradually converging towards the actual solution. 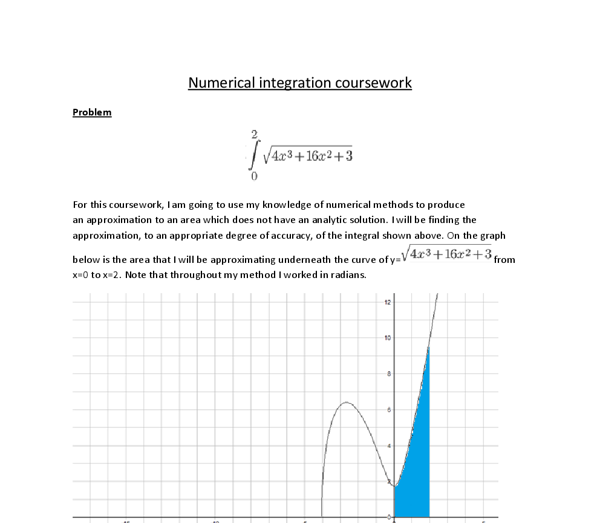 In reference to my graph the integral section is concave which means that the trapezium rule gives an overestimate and the mid-point rule gives an underestimate. As the number of strips increases the trapezium rule will tend to the solution from above and the mid-point rule will tend from below. In the mid-point rule the error is proportional to the width of the rectangle squared, or in mathematical terms, absolute error Mn= kh2, wherek is the constant. If the mid-point rule with n strips has a strip width of h, then the mid-point rule with 2n strips has a strip width ofh/2. Therefore when you double the amount of strips (n) the error decreases by about a factor of 4, the error multiplier is therefore 0.25. The error connected to the trapezium rule is the same as the error in the mid-point rule. 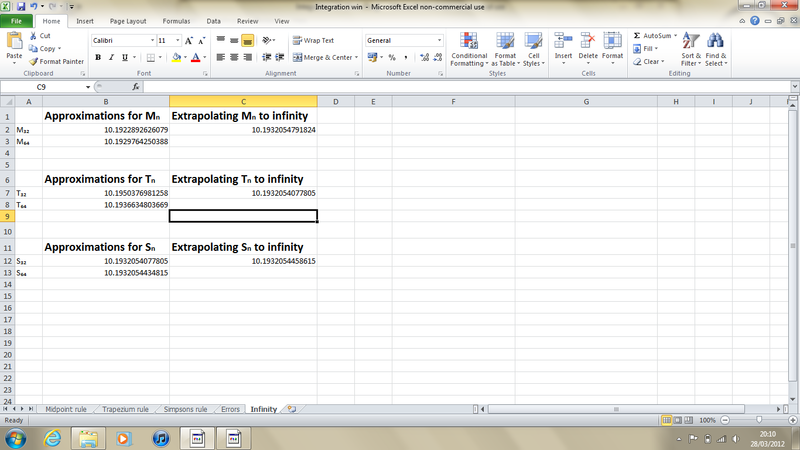 Using this formula we can now extrapolate our answers of Mⁿ to infinity. 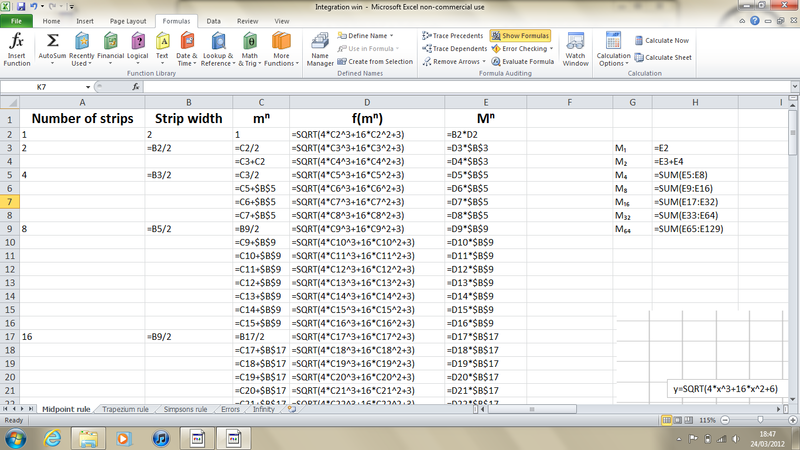 in the same way, just replacing M with T due to the error multiplier being the same. There was however some limitation. 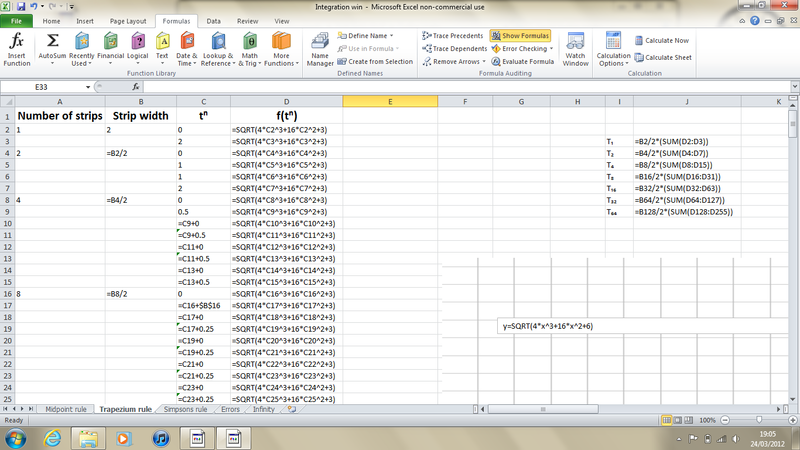 The software, Microsoft Excel, only calculated to 15 decimal places inevitably producing minimal amounts of error with each calculation done. To further improve my results I could have used better mathematical software which worked to more decimal places, but for a problem like this Excel was more than sufficient. The fact that the trapezium rule and the mid-point rule give the same solution up to 8 significant figures guarantees that my solution is valid to this many significant figures. 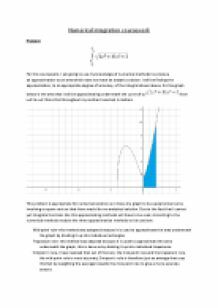 This is because, as I have indicated in the paragraphs dealing with error analysis, in the integral section of my graph the trapezium rule tends towards the solution from above and the mid-point rule from below meaning the solution is between the two. Simpson’s rule, being a weighted average, is more accurate and therefore likewise proves the solution. Overall then my solution is proved by 3 different rules. 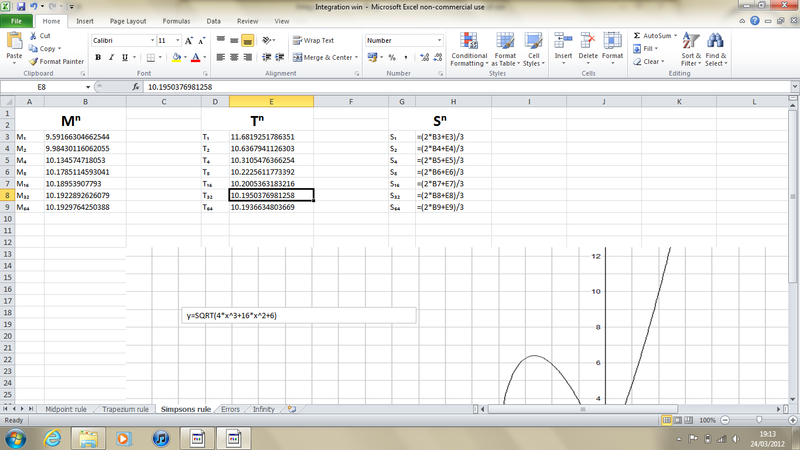 the overall gradient function, but I must find far more evidence than one solitary a value to give it any meaning. If this is the case, however, I think that when the co-efficient is 3, the whole gradient will be 3(nxn-1). For right angled triangle velocities only 2 calculations are needed to find the time it takes for the journey. I will use Pythagoras theorem and trigonometry of a right angled triangle. Departure Journey from Base Camp to observation site A Pythagoras' Theorem to find the speed of the flight a2 = b2 + c2 3402 = 302 + R.V. 0.6180339885 6.2360679817 0.0000000005 1.5369737685 0.0000000082 -0.0000000005 1.5369737675 -0.0000000121 Green corresponds with route 1, Red with route 2 and yellow with route three. Sum to infinity = when a is the first term in the sequence, and r is the ratio between terms. Thus = one has a 1 in 4 chance of making money when paying a $5 entry price. When compared to Case 1 and its odds of making money this game seems quite good. In this case this method will fail to find the target root we want. If we want to find the target root then we have to set up upper and lower bound very close to the target root in order to find the target root. f(??? ?f(??) > the area of the underneath the curve in figure 1.0 is thus h f(??) + h f(????? ?h f(??) + h f(??? ?? ?h f(??) > this can be generalised to Mn= h [f(??) + f(?????(??) + f(?????????? ?f(?n)] Note that Mn is dependent on the number of rectangles. 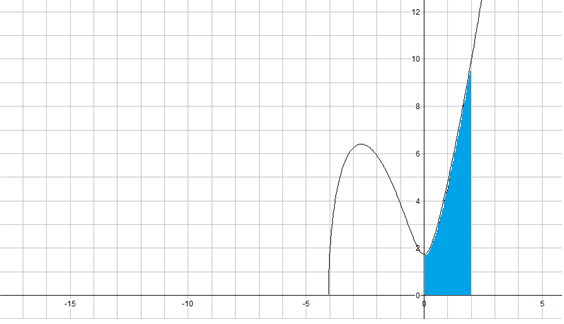 The able shows that there is change of sign from 0.752 to 0.753. This means that the root of the equation must lie between 0.752 and 0.753. Our estimate of the root is with a maximum error of � 0.0005.